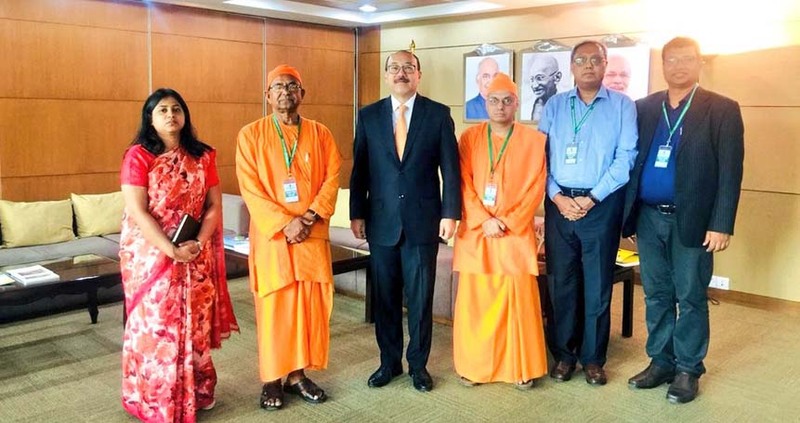 Swami Dhruveshananda, president, Ramakrishna Math and Mission, Dhaka called on the High Commissioner of India in Bangladesh, Harsh Vardhan Shringla at the latter’s office in Dhaka where they exchanged Bijoya Dashami greetings. Earlier, on the occasion of Durga Puja festival, the Indian High Commissioner to Bangladesh, Shringla had offered prayers at the historic Dhakeshwari temple in Dhaka on Wednesday. The Durga Puja festival is also celebrated by the Hindu devotees in Bangladesh with traditional and religious fervour. High Commissioner Shringla offered prayers on the occasion of Ashtami and sought blessings of Goddess Durga. The Indian High Commissioner to Bangladesh also distributed prasad among the devotees in the temple. Dhakeshwari national temple in Dhaka is a state-owned Hindu temple. The name ‘Dhakeshwari’ means ‘Goddess of Dhaka’.